The PENTAX angled PF-EDAII spotting scope features a 45-degree slanted lens barrel for comfortable viewing in just about any situation. 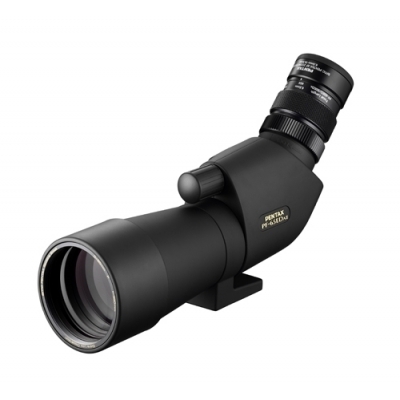 This scope is designed for high-precision outdoor viewing, along with enhanced optical quality which provides truer color tones. With porro-prism optics and a 65mm objective lens with extra-low dispersion optical elements, it delivers sharp, high-contrast images. Viewing in inclement weather won't be a problem as the PF-65EDAII is waterproof and nitrogen filled (JIS Class 6). 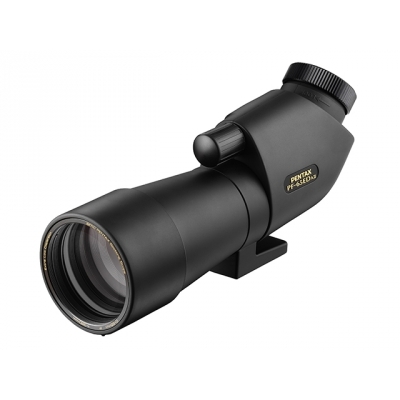 In order to optimize the PF-65EDAII's optical performance, PENTAX made a thorough review of the optical designs utilized in its previous spotting-scope models. It then made improvements to every optical element during the scope's development, including the incorporation of high-resolution ED (Extra-low Dispersion) optical elements in the objective lens. As a result, the PF-65EDAII offers a clear, bright image field in all types of observations and assures outstanding image quality in high-magnification digital photography using a digital camera. The PF-65EDAII features a compact, lightweight body with a 65mm objective lens to assure outstanding portability and maneuverability in the field. The PF-65EDAII’s barrel is slanted 45 degrees upwards towards the eyepiece end to assure the most comfortable viewing position, even when the subject is at the top of a tree or high in the air. The PF-65EDAII's 65mm objective lens incorporates ED (Extra-low Dispersion) glass elements to deliver a sharp, high-resolution image with minimal chromatic aberrations.